A Sudanese school teacher died in detention after being arrested in connection with protests in the east of the country according to family members. The 36-year-old man was arrested at his home on Thursday after protests in Khashm al-Qirba, they said, adding security officials told them he was poisoned. He had marks of being beaten on his body, the family said. Students, activists and other protesters held almost daily demonstrations across Sudan since December 19, calling for an end to economic hardships and mounting a sustained challenge to President Omar al-Bashir’s three decades in power. Rights groups say at least 45 people have been killed in protests, while government puts the death toll at 30, including two security personnel. Bashir shows no sign of conceding any power and blames the protests on foreign agents, challenging his rivals to seek power through the ballot box. 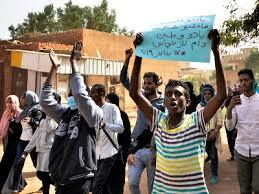 The information ministry said Sudan’s intelligence and security chief ordered the release of all detained during protests. The next day security forces detained the daughter of opposition leader Sadiq al-Mahdi, her family said. That listing deterred the influx of investment and financial aid Sudan was hoping for when the United States lifted sanctions in 2017, economists say. Sudan is expanding its money supply to finance its budget deficit. That has caused spiralling inflation and a steep decline in the value of the country’s currency on foreign exchange markets.